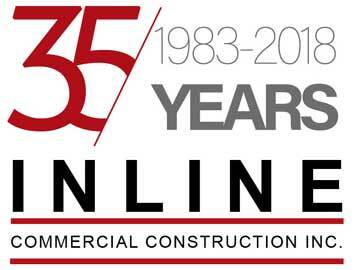 About Us - General Contractors - INLINE Commercial Construction Inc.
INLINE Commercial Construction is a Full Service, General Contractor Founded in Oregon in 1983. We perform general construction services in both the private and public sectors throughout Oregon and SW Washington. From concept to closeout and tenant improvements to new construction, our diverse project experience provides us with a comprehensive construction and safety knowledge. INLINE Commercial Construction is a full-service General Contractor established in 1983 by Dave Flint. Beginning as a small acoustical firm, Dave started INLINE as a one-man shop. Forming strong relationships with large healthcare and commercial companies, Dave was able to gain repeat business with preferred clients and grow INLINE into a competitive general contractor. As time went on, INLINE expanded in other market sectors such as education, financial and commercial work. In addition to a broader range of sectors, INLINE planted itself even more firmly in the healthcare world and works with the majority of the top hospitals and healthcare systems in Oregon. Today, INLINE’s projects range from small self-performed tenant improvements and repairs to new, out-of-the-ground multi-million dollar buildings. Some notable projects include the new PCC SE Campus Library and Student Commons, the large expansion/addition at Vernier Software & Technology, work at multiple Providence and OHSU locations, Pacific University work, and many projects for Portland Public Schools. INLINE actively supports company-wide and individual employee involvement in our community. Members of the INLINE team serve on several leadership boards to further share our community insight and give back to our profession in donated time and financial contributions. As a true Oregon grown company, our roots run deep across multiple generations with community contributions and participation at its core. Having graduated from the Oregon Minority Company Program, INLINE understands the necessity for DMWESB firms to have a place in the market and on job sites. Because of this, INLINE works with local DMWESB subcontractors and strives to reach at least 30% of DMWESB participation on all of our projects. In addition, INLINE is part of the Port of Portland’s Mentor Protégé Program as a Mentor. This program builds effective working relationships between leaders of mature, established companies and MBE/ WBE companies. Once protégés are accepted into the program they are paired with two mentors to learn through monthly meetings to develop business plans, marketing strategies, financial statements, and other company goals. INLINE actively supports company-wide and individual employee involvement in our community. Community involvement promotes and builds teamwork among all levels and divisions of the company. We have a long history of giving back both to the design and construction industry and the community at large. INLINE Commercial Construction is a full service, general contractor founded in Oregon in 1983. We perform general construction services in both the private and public sectors throughout Oregon and SW Washington. We respect your privacy. INLINE Commercial Construction (ICC) collects, uses, and protects information obtained from you on this website. We ask for only the information we need to provide the service you’ve requested. ICC does not use or disclose information about you or information that you may give us, such as your name, address, email address or telephone number, to any outside companies or parties. We do not rent, sell, or trade any of our mailing lists. ICC provides individuals with the right to opt-out of receiving email marketing and to update, supplement or delete their own voluntarily submitted personal information which ICC uses for the previously noted business purposes.